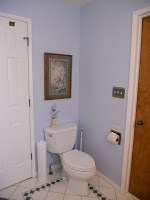 The Rose Suite bathroom’s newest remodel at Camai Bed and Breakfast is now completed. Our house is frequently under construction which makes it challenging to schedule work while making sure that guests are not aware of the construction. We have done fourteen major remodels. The latest work, a minor one, was to remove a huge cabinet which served no function. By removing the cabinet the bathroom now looks even more spacious. Last Friday the very large cabinet which extended up to the ceiling was removed. The cabinet is still good and was donated to Habitat Re-store where it will be re-sold. At Camai B&B we are an eco conscious and green award-winning bed and breakfast. After the removal, the wall was taped and mudded. Finally the wall was textured. Two days later I painted. A framed piece of Chinese art which Craig’s mother gave to Craig now hangs on the newly painted wall. New guests arrived same evening the project was completed.